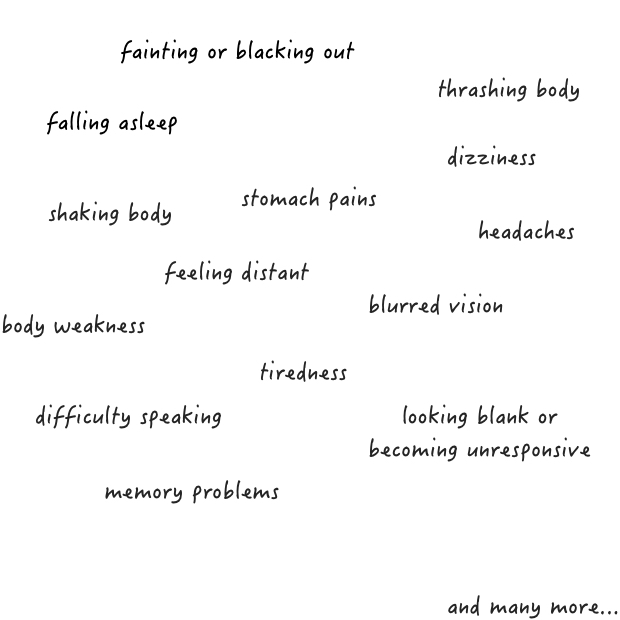 Non-epileptic attack disorder (NEAD) has a lot of different names. They can be called non-epileptic seizures, dissociative seizures, pseudo-seizures, psychogenic seizures (PNES), somatisation, psychosomatic and functional seizures. Unfortunately this can be confusing, but the different names all refer to similar symptoms experienced by young people. How are they different from epileptic seizures? Non-epileptic attacks may look like epileptic seizures but there are important differences. The brain normally works by sending electrical messages along nerve fibres to carry out tasks. In epileptic seizures the brain produces abnormal electrical messages. These abnormal messages cause the changes in people’s experience and behaviour during epileptic seizures. Although non-epileptic attacks look similar to epileptic seizures they have a different cause and there are no abnormal electrical signals. Non-epileptic attacks are the brain’s response to potentially threatening triggers inside or outside the body. Inside triggers include thoughts, memories, emotions or sensations. Outside triggers include difficult situations but also objects, scenes, sounds or smells which remind the brain of a difficult moment in the past. Sometimes this happens when people feel stressed. However, they can also happen to people who feel calm and relaxed. In most cases people do not know why they have them. Some young people and their family find it difficult to believe that something as frightening as a non-epileptic attack is not caused by a process that would show up on a brain scan. However, it is well known that emotions can produce physical reactions in the body. For example, everyone has blushed in embarrassment or felt their heart thump in their chest before an exam. Non-epileptic attack disorder may be a way of your body telling you that something is too stressful or difficult to manage. Some children have both epileptic and non-epileptic seizures. Your medical doctor will have told you which type you have. There is no single cause of NEAD. You may have read or been told that non-epileptic attacks are caused by an upsetting experience in the past. However, many young people with NEAD have not experienced any major trauma before developing the symptoms. Sometimes NEAD occurs when young people are struggling to cope with their own or other people’s expectations, or when they face difficult choices. Studies have shown school worry/stress to be the biggest cause for non-epileptic attack disorder in children. However there are other factors that can sometimes be related. These may include: bullying; rejection; family disruptions; conflicts; loss of a family member or friend; significant injury/hospitalisation. Sometimes the attacks seem to help people deal with their emotions and stress that are otherwise difficult to handle. Often children only have non-epileptic attacks in one place (e.g. school). This can make looking for triggers easier and help to find ways to manage or stop them happening. Do other people have non-epileptic attacks? Yes. In adults we know that for every 1000,000 people, between 15 and 30 have non-epileptic attack disorder. Nearly half of all people brought into hospital with suspected epilepsy turn out to have non-epileptic attack disorder. However, we are not sure how common non-epileptic attack disorder is for young people, but it is likely to be similar to adults. Yes. Children with non-epileptic attack disorder can recover fully and lead normal lives. Children with NEAD are more likely to become seizure free compared to adults with this problem. Non-epileptic attacks often get a lot better when the diagnosis has been explained, and when young people and their families have had a chance to think about what might have caused the attacks. However, some young people may need extra help to get better. Non-epileptic attacks are something that the brain has learned to do – a bit like sticking your arms out to stop you from falling on your face when you have tripped up. There are no tablets to stop non-epileptic attacks. However, you can learn to spot situations which are likely to cause the attacks. You can also learn to spot the first symptoms of a non-epileptic attack giving you more time to stop the attack from happening. Some people can learn to control their attacks by changing their breathing or by concentrating on something outside their body. People can also improve by addressing some of the causes of stress in their lives. All of these things can help the brain to “unlearn” non-epileptic attacks. You can learn these techniques during a course of psychological treatment. Several forms of psychological treatment may help, including Cognitive Behavioural Therapy (CBT) or psycho-education. If non-epileptic attacks are occurring together with other problems such as anxiety, depression or eating disorder, psychological treatment for these problems can also help reduce the attacks. It is important to remember that psychological treatment is not a quick-fix and can take time to work. Just like physiotherapy, psychotherapy often involves practicing things – starting with something that is easy and aiming for things which are more difficult. Most children who receive psychological treatment for NEAD report improvements of their attacks and their quality of life.